We were recently in New York and we had the opportunity to take in Harry Potter The Exhibition at the Discovery Times Square. Similar to Indiana Jones The Exhibition (original names I know), the display is a traveling exhibit that is put on at different venues around the world. Starting off in Chicago in 2009, Harry Potter The Exhibition has also toured in Boston, Toronto, Seattle, New York (previously), Sydney, and Singapore. After its worldwide tour, I guess the exhibition in back in New York for an encore. To start off the exhibit your group is herded into a dark room where eight or so flat screen TVs are setup vertically with a movie poster from each film displayed on them. After a minute or two the TVs change and launch into a coordinated introduction to the exhibit playing clips and custom graphics to get everyone pumped for the exhibit and to set the tone. After the intro video we were then ushered into another small dark room (chamber if you will) where up in front on a stool was the Sorting Hat itself! Ok so it wasn’t THE Sorting Hat, but rather a nice prop that looked like it. 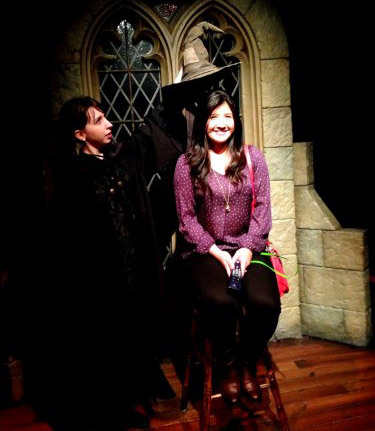 Along with the stool and hat was an attendant dressed up in Hogwarts garb fake accent and all. Since there were quite a few number of kids in our group we were courteous and let them go through the sorting process. Now, this wasn’t as big of a spectacle as it was in the film. My main gripe with the whole process though was that the hat wasn’t actually put on people’s heads. The attendant that was “sorting” people held the hat about six inches of off each individual’s head–not at all like the movie. This is exactly how people were sorted . . . hat not on the head. The second thing that wasn’t kosher to me was that the attendant asked each person what house they wanted to be in, and you know what . . . they were all sorted into those houses! Now I know that Harry Potter told the Sorting Hat that he didn’t want to be in Slytherin–so there is precedent for someone telling the Sorting Hat which house to put them in. However, I found it little too convenient that everyone that asked to placed in a certain house was placed in that house. I feel like the real Sorting Hat would put people in a particular house despite what they ask for. I know these were kids but come on, the real Sorting Hat wouldn’t pull any punches. After the sorting was done it was finally time to enter the main section of the exhibition where we could finally move on our own and check out all the cool props and costumes from the films . . .
Quiddich uniforms from the Quiddich World Cup. Props and costumes from the Death Eaters revival of Voldemort. The infamous Marauder’s Map and other miscellaneous items associated with Harry Potter. One of the few items you could touch and handle in the exhibition . . . the pulling of Mandrakes. The Boggart Jack-in-the-Box and wardrobe from the Prisoner of Azkaban. Items from the Goblet of Fire: the Triwizard Cup, Rita Skeeter’s quill and notebooks, name slips from the goblet. Harry and Ron’s room at Hogwarts, along with the golden egg from Goblet of Fire. And before you know it, you’re done. There’s actually more to the exhibit than the glimpses I’ve given you in these photos; but alas, you’re not allowed to take photos while you’re in the exhibition. And there lies one of the biggest points of contention that I have with the exhibition–no photography. Oh sure we could have snapped off a few photos with our phones; but with the exhibition dark in many places getting a good photo with just a quick snapshot was impossible. My other point of contention is that there aren’t that many items you can touch either. For an exhibition that prides itself with letting “guests will get an up close and personal” at the items on display; there was way more getting ‘up close’ than getting ‘personal’ with things in the exhibition. The items on display were worn and handled by the actors and who knows how many countless numbers of production staff on the film. Who knows if they were even handled by the cast or if they were one of many duplicates that were made for the film. Point being, these items were meant to be handled by people and yet here we were walking through the exhibit unable to do so. No touching of horcruxes (not that you’d probably want to), no taking photos with a Hungarian Horntail (again, that not you might want to), just plain old walking through and observing things that were made for people to wear or handle. To me that was the most disappointing aspect of the exhibit (hence the use of publicity stills throughout much of this post). So what’s the deal then? If this thing were to come to Hawaii could I recommend people see it? At $27 ($19.50 for kids, $23.50 for seniors) a pop it ain’t exactly cheap to walk around for an hour or so admiring props from Harry Potter. However, if you’re any kind of a fan I’m sure it will be well worth the time and money spent. If you were to go I would say make the most of your time and look at every single item and read every single placard description. Probably the biggest takeaway for me was that it made me want to rewatch the series again or maybe even read it. Going to the exhibit wasn’t something we specifically sought out to do, it was more something we stumbled into, so at the end of the day I was ok with our experience with Harry Potter The Exhibition. We’re always down for checking out movie stuff here at Red Band so we had a good time. The no taking photography and no touching of objects though, I just had to shake my head at that one. To me, that was just riddikulus. 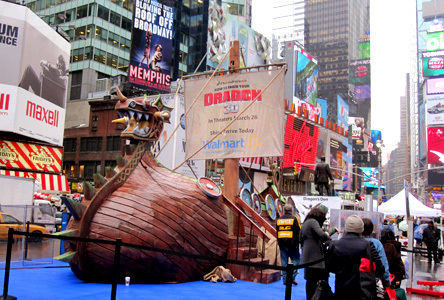 Yes, a viking ship in the middle of Times Square. At first we didn’t know what was going on, but as we ventured closer we realized that the big ship was part of a promotion for How to Train Your Dragon. Being the movie and marketing geeks that we are we had to get a closer look to see what was going on. Sadly though as we got near the ship we figured out that the promo had already wrapped up as they were starting to take everything down and put things away. As we made our way past the ship and continued through Times Square we saw a line with people holding passes to see How To Train Your Dragon waiting to go into a theater–classic sign of an advance screening. Later on I Google’d the event to see what we had missed and found out that the event was actually much bigger than we thought. Apparently America Ferrera (who voices one of the characters) was there along with a bunch of guys/actors dressed in viking regalia in an effort to mimic the movie. 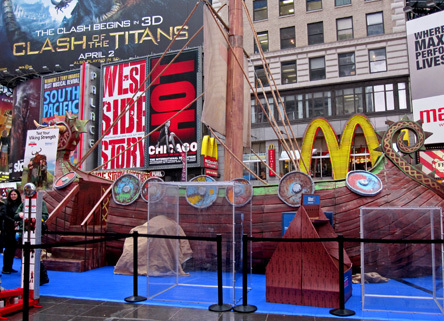 All of this was done in an effort to promote the film in New York City. Like the title of this post states, they do it bigger and badder in the Big Apple. Suffice it to say that it was pretty cool that we got to see a big movie promo being done in a big market (what was left of it anyway). I don’t remember anything of this scale being done here on Oahu. Possibly the biggest “in theater” celebrity promo we had (the only one we’ve ever had) was when Cary Hiroyuki Tagawa (of Mortal Kombat and Johnny Tsunami fame) was at the advance screening of Balls of Fury–but it just so happens that he’s a sometimes Hawaii resident so that was why he was here. The other big screening that I can recall was (that we didn’t go to) was when they screened Michael Bay’s Pearl Harbor at Pearl Harbor on the flight deck of an aircraft carrier. Man, wish I could have been involved with that event.